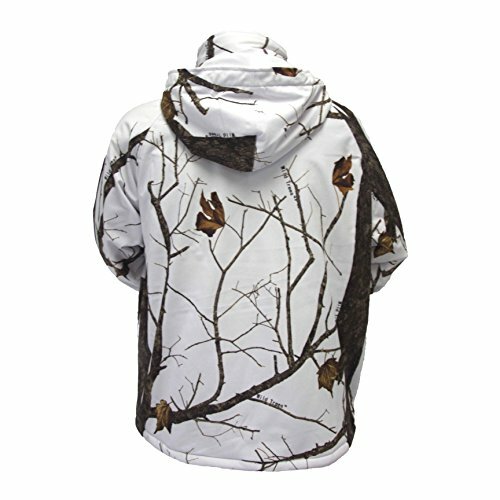 This comfortable, warm parka has polar fleece lining; high-cut storm collar; an elastic draw cord on the hood and waist; Velcro on the cuffs; a zipper front with button-down storm flap; and pouch pockets with side hand warmer. ?In 1950 a ten-year-old boy became a hunter on a cold, blustery day on Lake Hazel near Benson, Minnesota. Concealment in those days consisted of brown clothing and any natural cover you could find. We built a variety of boat blinds (some actually worked) and always had a bale of marsh grass to cover up with in the boat. In the 1970s, camouflage clothing became readily available and somewhat affordable. In 1998 WILDFOWLER OUTFITTER was founded, building its original Goose Decoy Blind and soon developed a line of lightweight camouflage parka and pants. Soon a Layout Blind was added to the product line, along with a few more patterns in the Cover Up Suit. In the spring of 2003 we moved our production facilities and expanded our manufacturing capabilities. We made improvements to our existing lines, adding additional products, including an exciting line of Waterproof Cover Up Suits. 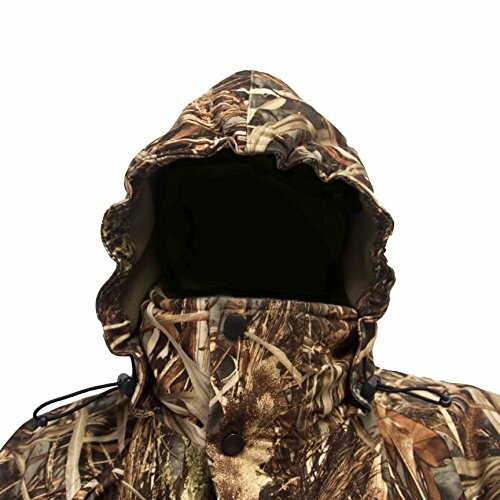 Today, we offer a complete family of Hunting Blinds, Blind Accessories, and Camouflage Clothing. We are known as "the concealment specialists" and continue to provide the waterfowl hunter with the best concealment products for the best value. That was the goal when Wildfowler Outfitter began, and it will continue to be our guide as we move into the future. 100% WATERPROOF- Taped Seams to keep water out, double waterproof construction. Shell with polar fleece lining. 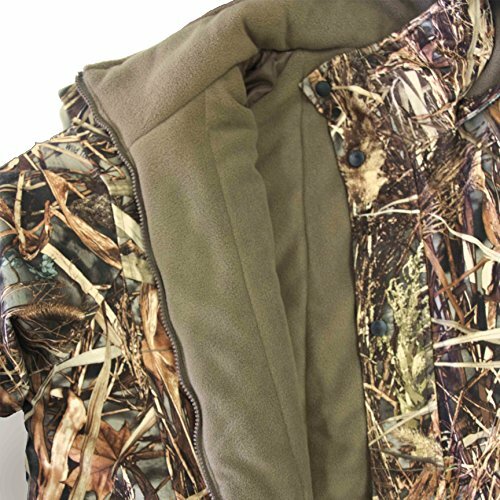 Hooded parka with elastic draw cord to keep you warm and dry QUIET- Soft Tricot Outer Material, great for all types of hunting WICKING BREATHABLE- great for comfort and moisture management. 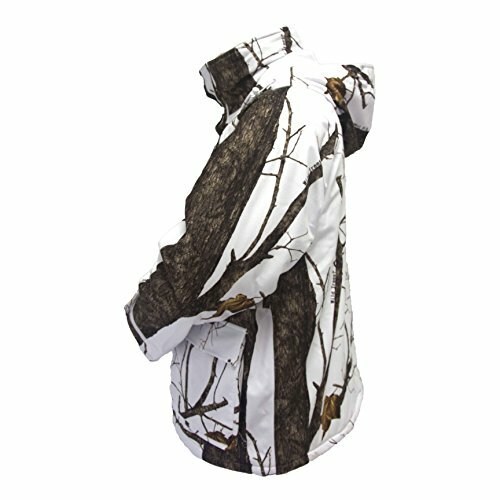 CAMO PATTERNS- Our patterns are the best on the market, we are the concealment specialists and have the best available patterns. 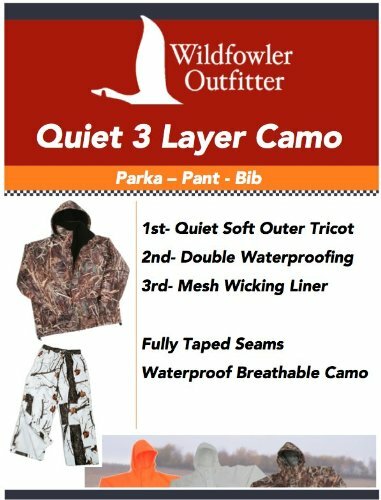 QUALITY- Wildfowler Outfitter products undergo strict testing and use only the latest materials and technology, a great blend of features and function in waterproof insulated Parka. Insulated to keep you warm zipper front with button-down storm flap elastic on the cuffs front slash pockets.